The iPad’s iOS 8 (and the Mac’s OS X Yosemite) has a neat new feature for work called Handoff that lets you move activities such as note taking and email composition on your iPad, iPhone, iPod touch, or Mac to a different device, picking up where you left off. It’s not really file sharing, although whatever you’re working on gets transferred in the hand-off. Any combination of iPhone, iPad, or iPod touch devices with a Lightning connector and/or a 2012-model-year Mac. Bluetooth and Wi-Fi need to be turned on, although you don’t need to be connected to a Wi-Fi network. Handoff-compatible apps. 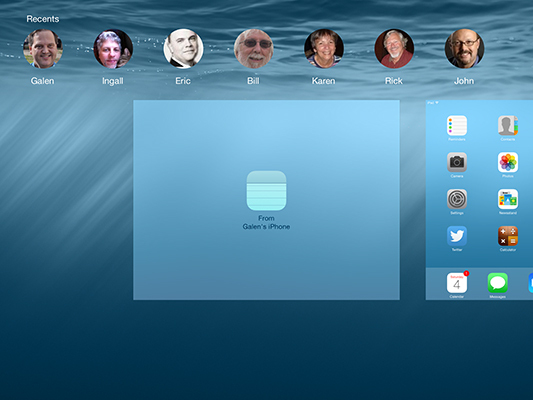 As of early 2015, those include GoodReader and Apple’s Calendar, Mail, Maps, Messages, Notes, Reminders, and Safari. When you’re using a compatible app and your devices are within range of each other — 10 to 30 feet, depending on how many walls and other barriers are in your physical space — the other devices will notice what you’re doing and offer to pick up that work. For example, if you’re entering an email on the iPhone, your iPad will be able to pick up the work on that email, with its larger screen and keyboard. Or those directions you looked up on your iPad or Mac can be picked up by your iPhone so that you can then navigate from them while driving. On the Lock screen, the icon of an available app displays in the lower-left corner. Swipe up from the app icon to open it. On a Mac, look for the available app’s icon on the far left side of the Dock, to the left of the Finder icon. Click the icon to open the app. After a few seconds, the app will transfer whatever was open on the other device so that in-progress email gets transferred, or that in-progress note. You can just keep working from where you left off before the hand-off. And you can hand off the same work to another device. For example, you might start an email on your iPhone, realize that it’s pretty involved, and so hand it off to your iPad. Then you transfer it back to your iPhone because it has a cellular connection that your iPad doesn’t, meaning that you can then send the email from your iPhone, even though you composed most (or all) of it on the iPad. That’s a neat trick!